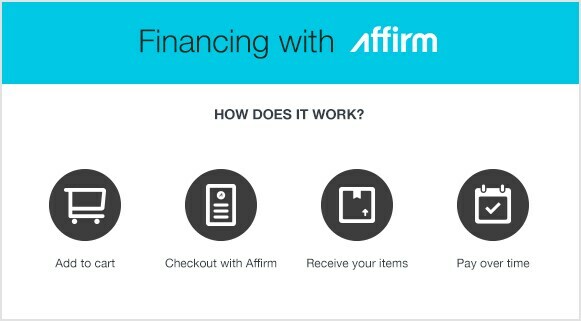 We have partnered with Affirm to provide you with a simple way to finance the string trimmer you need now and pay for it later. Affirm performs a "soft credit check" which will not affect your credit score. The soft credit check only allows Affirm to help verify your identity and determine your eligibility for financing. If you apply for more loans with Affirm, we may perform additional ‘soft’ credit checks to ensure that we offer you the best financing options possible, but your credit score will not be affected. If Affirm was unable to approve your application, Affirm will immediately notify you of the decision and denial reason via a secured message. For your privacy, only Affirm can provide information regarding your financing and application status. If you have an existing account, you can log into your account at www.affirm.com/account or contact Affirm via email at help@affirm.com for further information. We try hard to approve every purchase with Affirm, but sometimes we can’t approve the full amount. When this happens, we provide a debit card down payment option so that the customer may still complete their purchase right away. String Trimmer Financing With Affirm - Find out Shop String Trimmers Now and Pay Later With Affirm. Our string trimmer how-to library can help you pick the perfect electric string trimmer, gas string trimmer, walk behind string trimmer or brush cutter.